Have I really just finished my 13th harvest in Virginia? Indeed I have, and maybe now would be a good time to reflect on the decision to come to the Old Dominion and where the future lies for the 5th largest wine-producing state in America. As a young winemaker in South Africa, having just finished harvesting with Flagstone Winery I was afforded the incredible opportunity to come to the States to make wine. I was offered a job at one of the largest wine-producing estates in Napa Valley, arguably one of the most recognized wine-producing areas in the world. Producing incredible Cabernet & Chardonnay and many other fine wines’ this would have been a wonderful learning experience. yet I turned it down to come to a lesser known area on the other side of the country, the Monticello A.V.A in Virginia. It all came down to opportunities and being exposed to new things. Who would turn down the opportunity to work for a brand new winery, one that had not yet made a drop of wine. To be exposed to varietals that I had never had the opportunity to work with such as Viognier, Chambourcin, Touriga Nacionale and Norton [my love/hate grape] was far more intriguing. At that point the intention was to only be here for a year or so and head elsewhere, ultimately ending up back in South Africa making wine. “Virginia, huh?” said my father. Yup VIRGINIA. “Blue Ridge Mountains, Shenandoah Valley, Monticello, UVA, the canoe capitol of the world, but the wine is kind of crappy” said someone familiar with the area. Okay he did not say crappy, he used a much more colorful word to describe the wines, one that does not leave much to the imagination. “The wine is that good?” I replied sarcastically, sounds like a challenge and the perfect opportunity. Thomas Jefferson never produced a single bottle of wine from his Monticello vineyards and neither did George Washington at Mount Vernon, yet that pioneering spirit endures today in our wine making community, for walls are to be broken down and challenges met. Virginia might in many ways be one of the most challenging grape and wine-producing areas, but that did not stop Mr Zonin from establishing Barboursville Vineyards in 1976, hiring one of the most iconic figures in our wine industry, Gabrielle Rausse, to plant vineyards. If memory serves me correctly, Virginia had 6 already established wineries by 1970, 46 by 1995, 105 by 2007 and today a little over 200. People are starting to recognize the potential for producing fine wines in this area and are not deterred by the challenges that face them, for, as the saying goes, nothing worthwhile comes easily. I think Mr.Jefferson would be quite proud of how far the Virginia Wine industry has come, measured by growth alone. But hang on a moment, we are in the business of producing wines, and success is measured by quality not quantity. How we are perceived by consumers and critics, measured against the benchmarks of the American wine industry? Surely this is a better indicator of our success? Leading the way in the American wine industry, in my opinion, is California. Napa has been joined by Sanoma, Paso Robles and other areas in producing distinctive wines reflecting regional character. wines that receive critical acclaim by consumers and wine writers alike. And let’s not forget the states to the North, Oregon and Washington, who are also producing many world-class wines. Try Cabernet from Washington State and Pinot Noir from Oregon to see what I am talking about. So the big question. ” Are we making wines that are world-class and can compete with anything the West Coast can throw at us?” If we are comparing apples to apples, Cabernet to Cabernet, then the simple answer is No, not every year. However, every now and again we get vintages like 2009 and 2010 where we produce something special, our 2009 Estate Grown Cabernet was one of only 22 wines that received a double gold medal at the San Francisco International Wine Competition. So there is certainly potential there, even if mother nature only allows us the opportunity once every 4-5 years. If we talk about Viognier, Cabernet Franc and blended reds, then the answer, in my humble, biased opinion, is that you bloody well betcha. I have tried some Meritage blends, Cabernet Franc and Viognier wines that I think can more than hold their own with our West Coast counterparts. I would even go as far as to say that they can hold their own with other wine regions in the world. Not consistently year in and year out, but us winemakers are working on achieving that. I think the biggest issue facing Virginia and the future is one of identity. in that I think we currently lack one. Using Viognier as an example, purely because it is the State grape of Virginia, does a distinctive style come to mind? Not really. Viogniers can be sweet and syrupy, austere and centered on acidity, over oaked and dry, light and thin or rich and unctuous. Viognier wines run the gamut and in a lot of ways lacks a regional identity, i.e. the customer can not readily recognize it as Virginia. New Zealand Sauvignon Blanc, on the other hand, is distinctive and unique, as is Cabernet to Napa, Blends from the right bank of Bordeaux, Pinot Noir from Burgundy and Shiraz made in Australia. Wines that scream of place, un-ashamed and loud. Virginia needs this, needs a wine [or wine style] that proudly claims to be ours. Unfortunately, I think it will take a few more years to get there, but the results and the improvements over the last 10 years are nothing short of miraculous. So what are consumers saying about us ? If growth and sales of Virginia wine are anything to go by, then we are doing really well. Domestic sales of Virginia wine went up by 6% and exported wine sales went up by 70 odd %. 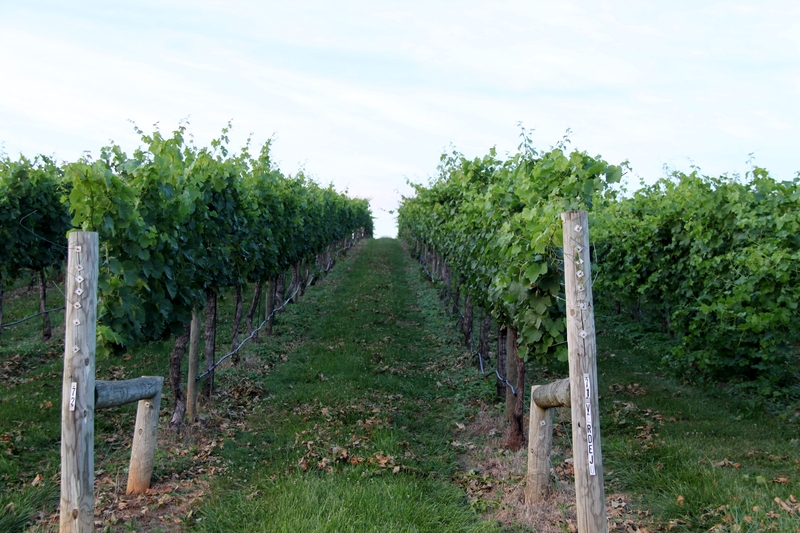 We have seen increases in sales out of state, out of country and within the state itself, which points to recognition from consumers that Virginia is producing world-class wines. I have always said that the best of Virginia can stand alongside the best from anywhere else, seems like I am not the only who now thinks that. FANTASTIC. The Future I would like to recognize a few people who I think have been instrumental in promoting our wines and our State. 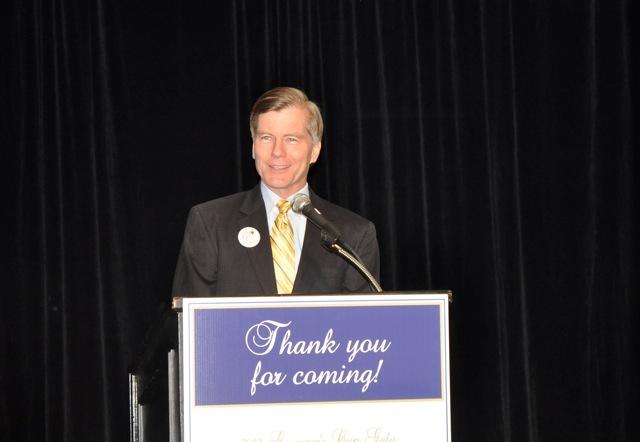 I think Governor McDonnell and the First Lady deserve a lot of credit for promoting our wine industry. Emerging markets have been opened through trade missions to Asia and to Europe, our wines are now being exported to China and London. By serving only Virginia wines at the mansion and by creating the Virginia Wine Summit, the Governor has really put a focus on our wines. 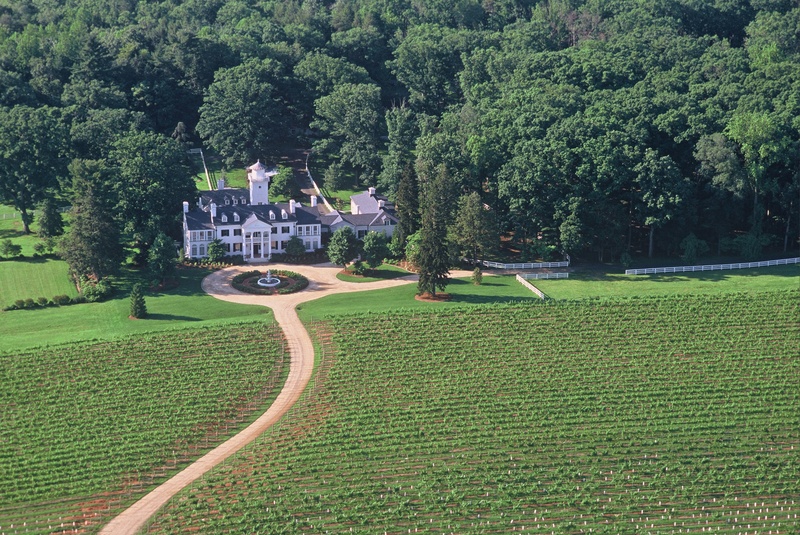 Wine Enthusiast named Virginia as one of its top ten wine destinations in the world. Along with Secretary Haymore and the Virginia Wine Marketing Office, we producers have the backing of people who can make things happen and get the word out there, a big thank you to you. In Tony Wolf and Dr. Bruce Zoecklein we have two gentleman whom I admire tremendously. Their work and willingness to be available to us has certainly increased the quality of our wines and vineyard practices. One need only attend any of the number of technical meetings to see the amount of work and effort being put into our industry, benefits that a re reaping big rewards today. And of course all the winemakers and vineyard managers in the State. I am amazed at the talent and the enthusiasm shown for this profession, combined with the willingness to work together. Lead by stalwarts such as Luca Paschina, Dennis Horton and Jim Law, the future of Virginia wine is in good hands and I for one am excited to write another blog in 10 years, raving about how our wines have progressed. There is still a lot of work to be done, we cannot rest on our laurels and we need to recognize that we are not there yet. We are moving in the right direction and at a frenetic pace, and people are noticing. So do I have any regrets about coming to Virginia and making wine? With the state of this industry, a beautiful wife and daughter to show for it and some decent wines in the library and nothing but a bright future ahead, WHAT DO YOU THINK? How good wine is really made at Keswick Vineyards, 5 easy steps. We have all read about how great wine is made in the vineyards- that if all being equal, the best fruit will ultimately equate to the best wine being made. True enough, better fruit gives you the chance to make better wines, but there are a few steps in the middle between the harvest and the bottling. So before you think this is about picking time, phenolic maturity, indigenous yeast and oak selection, let me offer you a different insight as to how we make great wine here at Keswick Vineyards. May I present, 5 simple steps for a winemaker to be successful. Invest in an awesome wife or partner. I think sub-consciously that I am trying to win a few points here, since my 4th year wedding anniversary is coming up and I still have no idea what to do. My wife Kathy [a.k.a the BOSS] is pretty understanding of what I do and puts up with me when most others would not. To be a winemaker means a lot of time spent at the winery, instead of being at home hanging out with the missus and the family. To be at your best, a winemaker needs a supporting [check], loving [double check] and understanding [mostly] wife who buys into your philosophy and passion about making wine. She does not mind waking up to grape skins in the bed and me spending money on obscure varietals such as Alvarinho and Molinara for purely "research" purposes. So to my loving wife, I say thank you for letting me do what I do, could not do it without your love and support and by the way, Happy Anniversary in advance for the 1st [in case I forget]. Work for someone who allows you to express yourself. Okay, I admittedly work for my in-laws and they by law have to put up with me. Truthfully though, they give a fair amount of free reign to experiment and tinker in the winery and vineyard. Sorry Al, I know you prefer V.S.P but I really think the ballerina system is the way to go. It is easier to work for someone who shares your love and passion for wine, and sees the bigger picture. Al still has not bought into the notion of drinking his 50 year old first growth wines for research purposes on a Sunday evening, but I cannot get everything I want. Maybe I need to talk to his boss Cindy. Truly a big thank you to them for allowing me to do what I do. Have a good vineyard/support staff. As much as I have tried, I cannot maintain 45 acres of vines on my own, I have to delegate and rely on others. These are the guys and girls that deserve a lot of credit, working in 95 degree heat is not fun and they do it day in and day out for me. 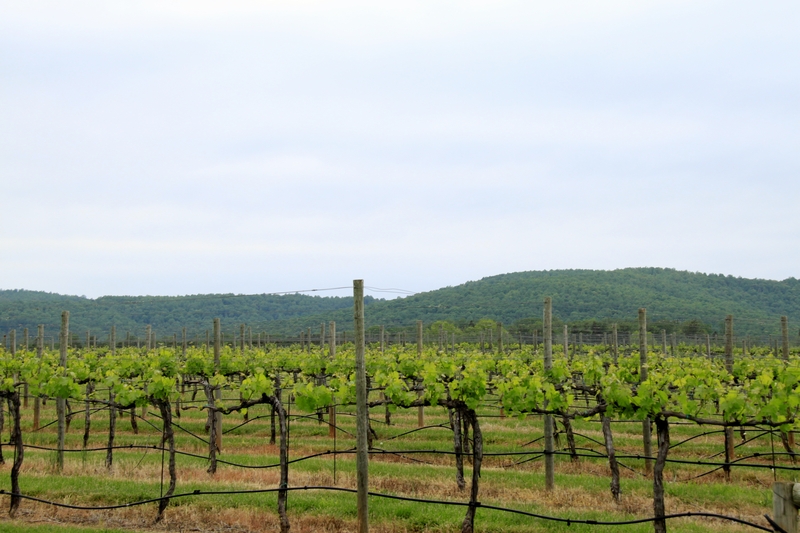 Virginia is not the easiest place in which to grow grapes and a lot of work, effort and sweat goes into producing them. I like to say that we are minimalistic in our approach to making wine, but it takes a lot of work to be that in the vineyard. 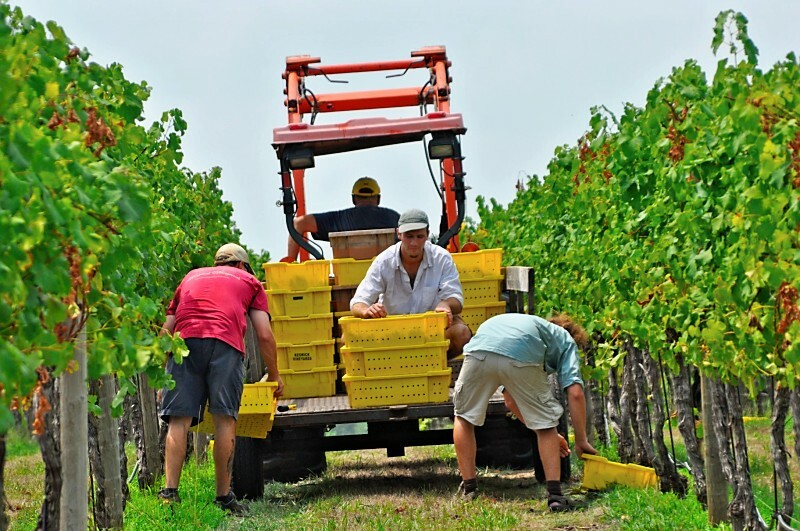 You can only be hands off in the winery if you are hands on the vineyard and while I ask and demand a lot in the vineyard, my crew over delivers each and every year and deserves extra kudo's. So kudo's to you, Thomas and PJ, from me, thank you guys for a wonderful job. Have a great front and back office staff. I think that what is in the bottle is only a small part of the whole experience when you visit a winery. A wine can be well made but the taste left in your mouth can be sour if the experience and customer service is not up to par. We put a lot of effort into training and I think we have an exemplary staff who do a wonderful job in presenting our wines to the customer through our tasting room and wine club. I am always proud to hear first hand from a customer that they had a wonderful experience, and more importantly, that they will be back in the future. No-one can tell your story better than you, and I am lucky to have a staff that do a great job in promoting not only our wine, but all of those made in the Commonwealth. In their hands, the future of our winery is a bright one. Thank you also to the back office staff, Leah for paying me on time [always appreciated] as well as to Brian and Kathy who tirelessly promote our winery. A loyal customer base and fantastic wine club. The reason we pour heavily is to make people happy! Not quite true, but we are here to make the customer happy. Customer is king and we thank each and every person that has and will buy a bottle of our wine. We are blessed to have a loyal following and I believe the 4th largest wine club in Virginia, some that have been members since our tasting room opened in 2006. It is a great feeling to call a lot of them our friends and I thank everyone for their support. In return I am happy to take case orders for that endorsement. Wine-making and farming is not an easy endeavor, but it does help when you have some of the finest people supporting you and having your back. This is a shout out to my wife, my family and all of my staff for making my job a helluva lot easier. 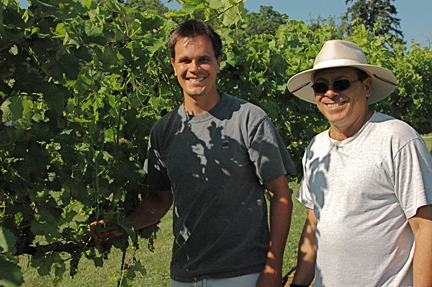 Our winery success is in no small way directly attributed to them. Personally, I thank everyone of them. P.S - if my staff are reading this, please get back to work! Ah, the often mispronounced grape of Croation origin [possibly] and revered in the Rhone appellation of Condrieu and Chateau Grillet. 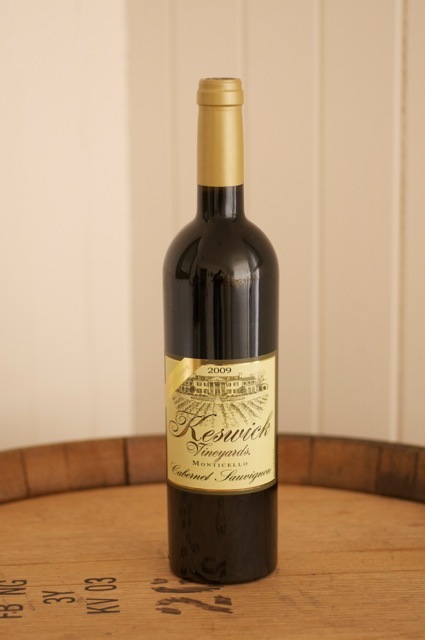 It also happens to be the State grape of Virginia and, lucky for us here at Keswick Vineyards, the largest planting under vine on the estate. With up to 6 annual bottlings each year, it is safe to say that Viognier has, and will continue to play a major role in wines produced here at Keswick Vineyards. Following a challenging 2011 harvest, I was looking forward to getting back on track and working with better quality fruit from the 2012 vintage. Having negotiated the threat of early season frost [which always seems to affect Viognier the most] the growing season was fairly ideal, with enough rain and moderate temperatures to keep the vines healthy and balanced, that was until we got the heat wave in July. These warmer temperatures ultimately led to the harvesting of our Viognier in late August, a full 2 weeks earlier than what we normally do; albeit at great physiological ripeness and, more importantly, clean fruit. Our goal with our Keswick Viognier, differentiated from the Reserve, Signature and LVD brand, is to highlight the wonderful aromatic character of the grape. To that end, this wine is generally a blend of wine fermented and matured in a combination of tank and neutral French oak barrels. 70% of the final blend was fermented in tank and kept there for the duration of the maturation to ensure we had a component that was bit more acidic, brighter and ultimately fresher. Viognier has a tendency to be really oily and acidity in the final wine, in my opinion, is sometimes lacking, so greater emphasis for us is placed on this component. We picked this fruit slightly greener, using acid as the primary indicator as to when to pick. Fermentation was really slow and conducted at colder temperatures, finishing only 28 days after first being initiated. After fermentation, we sulfured the wine to prevent the secondary fermentation, where malic acid turns into the softer and richer lactic acid, and topped the wines off to ensure the wines were stored safely. The portion of barrel fermented Viognier was picked a full 7 days later, with greater emphasis placed on sugar and flavor development within the berry. After pressing, the juice was transferred to neutral barrels [ones that do not impart any perceptible oak]. 50% of the wine was allowed to ferment naturally [without the addition on commercial yeast] while the remaining 50% was inoculated with a variety of strains to build up variety of flavors and layers. To this end, we conducted a rigorous barrel stirring regime throughout the maturation period to take full advantage of the dead yeast [lees] in the barrel. Enzymes start to break the cells down, releasing mannoproteins and polysaccharides into the wine, creating a wine that is fuller, richer and creamier than wines generally fermented in tank. Prior to assembling the final wine to be bottled, we blended multiple lots and barrels together until we were satisfied with both the wine and the style of the wine. We felt that 70% of the tank wine ensured that we did not compromise the freshness and brightness of the Viognier, while the remaining 30% of barrel fermented wine ensure the palate was still layered and complex, ensuring the final wine was extremely well-balanced. We think the wine is fantastic and have chosen to release it tomorrow officially in the tasting room. The wine was bottled in March and has had an additional three months in bottle to really come together and integrate. Having tasted it last week, we think it is both varietally correct and representative of the style of Viognier that our customers have come to love. I believe that 2012 will prove itself to be a strong year for whites and our new Viognier will hopefully validate that point. Time for Viognier to take center stage again. Hopefully you will enjoy the wine as much as I enjoyed making it. By technical definition, authentic, or authenticity refers to something being "real" or "genuine", the origin of which is supported by un-questionable evidence. One can easily apply this definition to a document, which has been authenticated or to as something as simple as a restaurant, where the food served could be deemed authentic. How does this apply to wine though, and more specifically to Virginia, and Viognier? The reason for this conundrum, is that of late there has been much discussion of what Viognier's produced in Virginia should taste and smell like, to be truly thought of as being authentic. This in truth is a notion that I have long struggled with, having made wine in this fine State for over 10 years now. Is it merely enough to say that wine made from that particular varietal in this State, satisfies the notion of authenticity, or do we delve deeper and develop a style of wine that speaks of authenticity. How do we define that style? How do we create this style year in and year out taking into account the vintage variation that we experience? More importantly what is the style of Virginia Viognier that may satisfy the customers notion of authenticity? But what of the climate, soils and age of vines that inherently affect the taste and smell of the wine, the much maligned concept of TERROIR. The set of special characteristics that the geography, geology and climate of a certain place, interacting with the plant's genetics to produce a product [in this case wine] of unique and UN-replicable characteristics. So what the heck do we compare our wines against? To even begin to answer that question, one should probably have a benchmark of what Viognier should smell and taste like, a control if you like to compare our wines to. Historically speaking, Viognier is an ancient grape possibly originating from Dalmatia [present day Croatia], brought to the Rhone by the Romans. Viognier is the single permitted grape variety in the appellations of Condrieu and Chateau Grillett, which are located on the west bank of the Rhone River, about 40 km south of Lyon. This could be an ideal benchmark for Virginia right? Is there something specific about the grape that is consistent with other wine-producing regions? Could there be similarities in aromatics, texture, longevity that discount that above mentioned intangibles? So let's take a look at the chemistry of Viognier to further try to answer this question. The grape is generally very floral due to terpenes, similarly found in Muscat and Riesling. Terpenes and terpenoids are the primary constituents of the essential oils of many types of plants and flowers. An essential oil is a concentrated hydrophobic liquid containing volatile aroma compounds from plants. So essentially speaking, there should be some aromatic characteristic that may link French, Californian and Virginian Viogniers. Having tasted my fair share of wines from all the above mentioned regions, I did find some common threads. Many times my notes included descriptors of peach or apricot, honey suckle and stone fruit which speaks more of varietal correctness than of authenticity. A wine made in California that is barrel fermented versus a wine that is tank fermented will inherently taste and feel different in the mouth, none less authentic than the other despite the variations in style. So to come back to the notion of "Authenticity" and whether us Vigneron's in Virginia can claim to be authentic. I say with the utmost confidence that we can, although we make stylistically different wines than many other wine-producing areas. Our Viognier's can be razor like with their acidity, with underlying mineral and stone fruit characteristics. A wine that may be a touch lighter, but arguably more food friendly and often times more drinkable in its youth. Our Viognier's can also be rich and flamboyant, coating the mouth with their oily textures and subtle hints of oak. These are fatter wines that change with time in the bottle. We also make wonderfully sweet "stickies"; dessert wines with gorgeous aromas that satisfy the sweetest tooth when the occasion beckons. Each style of wine has commonalities that make it distinctively grape specific, each authentic in their own right based on "terroir" or winemaking preference. For those that are still not satisfied with this concept, or the inability to define it, be at least assured that we as winemakers are also trying to answer that question, but that it will take some time and work to truly grasp this concept, if we ever will. For we have only been at it for 30 odd years, and we have many years to go before we can begin to understand and communicate this concept. Enjoy, as I do, the characteristics of the vintage, the deft touch of the winemaker or the personal preference of the consumer, all of which reflect the notion of "Authenticity". Perhaps we could change the definition to that of "If the wine reflects and portrays everything we hoped it would, and brings joy to those that consume it", it could lay claim to the notion of Authenticity. I would be happy to say that our wines have successfully fulfilled those criteria. Keswick Vineyards, and the year thus far. I have been reminded by my wife that my blogging career has taken a serious turn for the worse of late, and that I have shirked my duties. My apologies. It is hard to believe that 2012 is almost half over and that we are around 60 days from starting the 2012 harvest. Where has the time gone? After the challenging 2011 harvest, we duly set about pruning the vineyard after Christmas with the intention of building the vineyard back slowly. This was done by reducing the number of buds on the vine, and also by a new pruning method of cane pruning. In the past we have spur pruned, whereby 3-4 spurs [each having 2-3 buds] are left on each of the cordons. Cane pruning means laying down a one year old shoot, leaving 6-8 nodes, simply establishing a new cordon each and every year. The primary reason for cane pruning, was to allow us to remove cordons and shoots that showed incidences of phomopsis. Phomopsis Viticola overwinters as Pycnidia on infected wood between one and three years old. When the Pycnidia are wet, the exude spores that are splashed onto developing shoots. These spores then germinate in warm temperatures, and under conditions of high humidity, infection can take place within a few hours. This is one of the challenges facing growers as fruit and the rachis [main axis of the inflorescence of Vitis vinifera] can become infected throughout during the growing season. When fruit starts to ripen in the latter stages of the growing season, the pathogen becomes active leading to fruit rot. Symptoms include browning and shriveling, almost resembling black rot. Pruning is done during winter while the vineyard is in a dormancy phase. This year however, mother nature thought that 70 degree days were called for, great for pruning in shorts, not so great when it leads to an early bud break. We started noticing some cuts starting to bleed [due to osmotic forces pushing liquid from the roots], which is one of the early signs that vines are starting to break dormancy. Our vineyard duly had bud break March 22nd, while we were still frantically trying to complete the pruning of the vineyard. 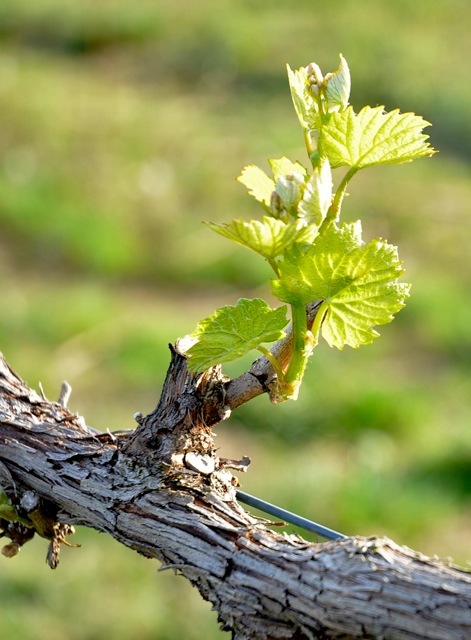 One of the issues of an early bud break is the susceptibility of the vines to spring frosts, and true to form, Mother Nature duly obliged and threw seven days at us where temperatures were below freezing. We experienced a radiation freeze, marked by beautifully clear skies and no wind. Under these conditions, air stratifies near the ground and radiant heat loss occurs from the ground and vine tissues. 4 am is such an un-appreciated time of morning, well when you are forced to get up, you just convince yourself it is a great time. Wind machines were duly run, frost dragons were making their way through the vineyards and raging fires were tended to, all trying to raise the ambient temperature to protect our vineyard. We did lose some fruit, estimated at about 5% in the Chardonnay but for us that is a minor miracle. Flowering and fruit set duly occurred with no major issues, and I am happy to report that we have a full crop thus far. I touched on the fact that we have been experimenting the slightly different training techniques and since last year gave us no good indication of how effective our new systems are, we are once again trying to grow in the fruit in a slightly different way. Conventionally vines are trained vertically in a series of catch wires, aptly named the Vertical Shoot Position [V.S.P]. we however are experimenting with a split system or divided canopy, whereby only 50% of the shoots are trained vertically while the rest of the canopy is allowed to hang down. There are a couple of thought processes with regards to this system. Our primary soil is clay, which leads to pretty serious vegetative growth. In our climate marked by warm temperatures and high humidity, we have to be mindful of diseases. By splitting the canopy we feel we can create and an environment that allows great air movement through the canopy, better sunlight exposure which ultimately suppresses the disease pressure and more importantly riper fruit with better flavors. Our best fruit, which grow on some of our poorest soils are still trained vertically, where vigor and retention of water does not pose any serious threat to the quality of the vines and thus the fruit. At this point in the vineyard we are trying to ensure the vines and vineyard are in balance, ensuring that we leave the optimum amount of fruit that will be harvested at ideal picking parameters. We are currently pulling some leaves on the East side of the vines, exposing the fruit on the cooler side as sunburn is a serious threat with temperatures forecasted to reach the 100 degree mark in the next few days. A lot of people ask us about the attitude towards diseases and what we do to combat it. The honest answer is that we have a detailed spray schedule worked out, whereby we spray what is needed, when is needed and most importantly how little is needed. It would be fantastic to talk about organic grape growing, probably even more marketable would the term byoynamically farmed. The truth of the matter s that Virginia's climate [in my opinion] does not allow the wine grower to farm organically. We would lose our crop to everything ranging from Downy and Powdery Mildew, to Black Rot, Japanese Beetles and aphids. We rotate sprays so that the vineyard does not build up any resistance and we ensure that our sprays are stopped well in advance, so that no residual spray materials come in when the fruit is harvested. The vineyard looks in great shape right now, we have plenty of fruit, no diseases and more importantly I think we have the balance right. Unfortunately a lot can change between now and harvest, as the weather has the final say and pretty much determines if we can one day look back on 2012 and say that it was one heck of a vintage. All we can do is chug along and look after what we can. I am cautiously optimistic about this years harvest, what will be the 11th harvest at Keswick Vineyards. I will chat with you soon about some of the exciting wines to be released in the upcoming months. Have you ever wondered how a winery and winemaker confidently predicts how a wine should be tasting it's best in 8-10 years? When you have a few years of wine making behind you, have a style that has been consistent and grow grapes in a conducive environment; then guessing the age ability of wine is really not that hard. That being said, we assume the wine is not being kept above the kitchen stove where temperature fluctuations happen on a daily basis, instead they are being stored in pristine cellars where temperature and humidity levels are perfect. So why are storage conditions so important? There are three storage conditions of concern to collectors and consumers of fine wine: light, humidity and temperature. The storage area for wine must be dark because ultraviolet (UV) light will damage wine by causing the degradation of otherwise stable organic compounds found in wine. Since these organic compounds contribute to the aroma, flavor and structure of the wine, the changes caused by UV light result in the deterioration of the essence of wine. Have you ever wondered why clear glass is not often used anymore, with darker green bottles being preferred for red and white wine? Well now you know. The only reason humidity is an issue in wine storage is because of the use of the traditional cork seal. The relative humidity of the storage area (i.e., the amount of gaseous water in the air) can exacerbate the rate of evaporation of wine from the bottle if the cork is defective. Since corks are far from perfect in their ability to seal a bottle of wine, ullage (the space between the bottom of the cork and the wine level in the bottle) develops in almost all bottles stored for extended periods due to evaporation. If the cork (seal) is defective, low humidity in the storage area will result in wine moving out of the bottle faster over time and significant ullage will develop in less time under these conditions. Thus, the more important issue is the quality of the cork seal and not the relative humidity in the storage area. Of course, very low humidity can dry out the cork leading to sealing problems. The advent of technical closures and screw caps though sort of takes the humidity issue out of the equation, but the conundrum is. Are wines bottled under screw caps, really destined for long-term aging? There are some trials being done on wines bottled under screw caps and the results are quite astonishing but that is for another blog I think. Assuming one has good cork seals, and a non-drying (i.e., moderately humid) and dark storage area, the most important factor in the storage and aging of wine is temperature. If you ask most anyone associated with wine, from collector to so-called expert, they will most likely tell you that the ideal storage temperature is 55° to 60°F. According to conventional wisdom, wine develops most harmoniously if stored in this temperature range with little or no fluctuation. So, for example, an excellent storage temperature would be 55°F with a fluctuation of plus or minus one degree. Lets assume that storage is perfect and that all variables associated with atypical aging have been taken care of, all that leaves is the quality of the wine. Hang on a moment, what determines the quality of a wine, what if it was a good wine that was designed to be consumed in one to two years? The plot thickens. Hah, a great wine can certainly be something that needs to be consumed young, think Sauvignon or Chenin Blanc for example. Their charm lies in their accessibility and their lack of over complicated terms and descriptors. I would just love to read a label where it says the following. Enjoy me, for I am delicious Case closed, drink it how you like, when you like and with whom you like and if you love it, have another. With all the food pairings, temperatures you have to serve it at, don't we sometimes just have to remember to enjoy the wine, is it not the reason we make it? Before I digress too much further, as a winemaker I am asked to write back labels for wines that I have made prior to them being bottled. The information we provide includes the blend, some flavors and aromas the customer might perceive and the age ability of the wine. For our 2007 Heritage, I said the wine should age 8-10 years and drink beautifully. The question is, can I confidently say that the wine will actually taste that good if someone laid it down for that period of time? Honest answer, I think so but do I know for certain, NO! I thus thought I needed to develop a tasting guide for all the wines that we have made here at Keswick Vineyards, advising the consumers who have these wine in their cellar, if they needed to be drinking or holding onto them. My research project thus consists of opening up 115 wines over the next few weeks and developing new tasting notes with the suggestions of drink now; not yet ready or past its prime. It should be a very informative period of "tasting", one that will be hugely beneficial to me as a winemaker to re-visit wines that I have not tasted for a while. I should also able to go back to my original notes and see how these wines have aged, as I have them stored in a Eurocave where the temperature has been constant and any atypical aging can be directly attributed to wine making instead of environmental conditions. I shall take into account vintage variation, wine making methodologies and wax lyrical about non-interventionist wine-making. I shall present a very honest opinion [for this will be from my point of view] about how the wines are tasting at that very moment. I am therefore asking if you taste an older vintage of our wines, please let me know what you think about it. Could the wine age longer or was it past its prime and how long would you still leave it for if you have another bottle. I hope to have this tasting guide up in about a month. HMM, 4 weeks and 115 bottles of wine as a rate of 28.7 bottles per week. You have got to love doing some research! Stay tuned for the results. I love wine, I drink my weight in wine and if you have seen me lately you will know that I am saying I drink a fair bit. One of the most fascinating about this elixir is that it transports you a to another world, in that the wine you drink reflects the area or place in which it was grown. Why is a Chardonnay from California so remarkably different to one from Burgundy? The concept of Terroir speaks to this notion, that due to a variety of influences [soil, elevation, row direction, planting density, cropping levels etc] a wine from distinctly different areas will always taste unique. No matter the influence of the winemaker, a Chardonnay grown in the Cote d Or of Burgundy will taste remarkably different to one grown in the Russian River AVA of California. You could argue that there are stylistic similarities [full malo-lactic fermentation or the use of French oak], but that the inherent differences in the wine will always take you back to the place where it all starts, the vineyard. Thai food was on the menu last night, and I thought it the perfect opportunity to break open a few bottles of wine. I am beginning to see a trend between Asian inspired dishes and my need to open up really good wine. Last nights trip of choice, was to South Africa with a gorgeous Springfield Estate 2008 Wild Yeast Chardonnay and France, with a 2005 Chateau Haut Bergeron from Sauternes. The Chardonnay is made by winemaker Abrie Bruwer, and the estate is located in Robertson, South Africa. I have always been an admirer of this producer and if you get the chance, look for the "Life from Stone" Sauvignon Blanc and the "Methode Ancienne" Cabernet Sauvignon, you will not be disappointed. With many tools at a winemakers disposal nowadays, this winemaker tends to go back to basics and focus on the vineyard, producing world-class wines that reflect the sense of place. His wine making philosophy is one of minimal interference, fermenting wines with natural yeast, avoiding filtration unless absolutely needed and as the website quotes "let the wine make itself". The 2008 harvest was by all means a fairly tricky one, with cooler than average temperatures and higher than average rainfall. Many producers talk about the fight against fungal disease and the importance of picking at the right time. The biggest positive is that cooler temperatures lead to retention of acid in the fruit and better phenolic ripeness. [Information taken from Angela Lloyds 2008 harvest report]. 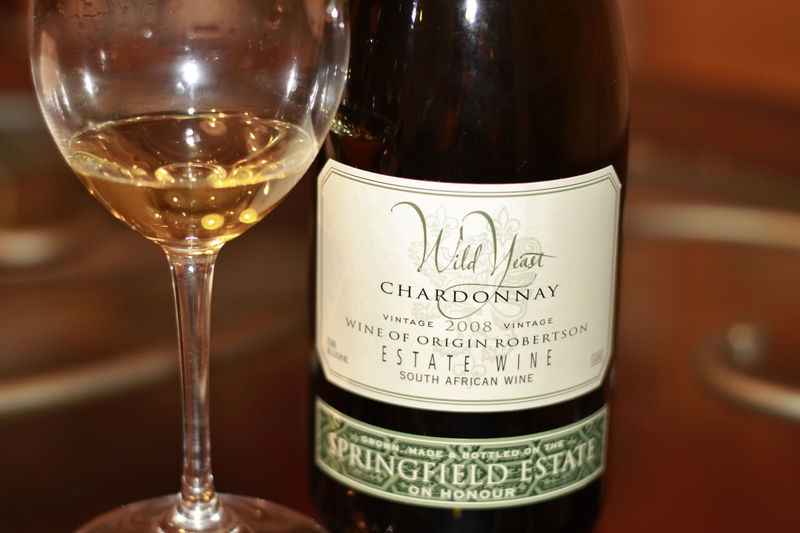 The Springfield Chardonnay is fermented entirely in stainless steel tank but is allowed to undergo 100% malo-lactic fermentation, and is furthermore aged on the lees for over a year prior to bottling. The wine displayed gorgeous tropical aromas that followed through onto the palate, marked by vibrant acidity which ensured this Chardonnay was lively and focused. I have been pretty down on Chardonnay wines recently, but this wine will certainly change a few opinions and is a champion that Chardonnay still has plenty to offer the consumer. You owe it to yourself to seek this bottle out and give it a try; not withstanding it is from my home country, I really loved this wine! From New World to Old World, a dessert wine from Sauternes finished the evening off. This particular Sauternes is made up of 60% Semillion and 40% Sauvignon Blanc. 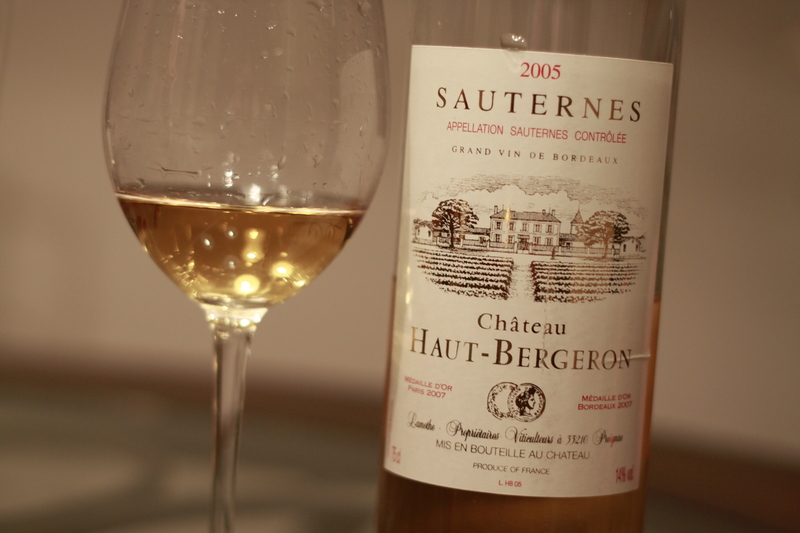 Many experts believe the Haut-Bergeron to be the best of the Non-Classified Sauternes. Part of their vineyards are in Barsac, with the remaining vineyards in Preignac [right next to the world-famous Chateau D Yquem]. The first thing you notice is the gorgeous color which is brilliantly gold, with amber tinges. The aromas are rich and luscious with apricots, honey and caramel tones. This wine is wonderfully textured, rich and lengthy and I suspect there is a fair amount of new oak in this wine [although I cannot confirm]. For all my praises; my wife Kathy did not enjoy this wine at all, alluding to a smell that just did not agree with her. The beauty of wine is that we each have our own opinions. I thought this wine to be showing beautifully though and may still have a few years left in the bottle, although I would probably drink it in the next 2-3 years. What a way to spend an evening, eating Thai food, drinking South African and French wine will sitting in Charlottesville US. Life is good especially when you can share it with people you love. This was one trip worth taking, and that for me is the ultimate beauty of wine. Tonight I think I might visit Australia.